The Frame Family: He's here!!! We love this little guy so much and we are so blessed that he chose to be part of our family! I never knew I could love another one as much as I love Ko! These two are going to be best buddies! It really is hard to imagine that you could love another baby as much as your first, But as soon as they come it sure is just like instint love. Congrats you guys he sure is a handome little guy just like his brother. he is beautiful! congratulations. i'm so glad everything went so smooth. i love his hair and his name. hope you are feeling good. you look awesome! congratulations! we is such a sweetheart. it looks like kohen is in love too. I am so happy for you & your little family! He is absolutely beautiful! I'm so glad that everything went smooth & quick. That last pic is precious of Ko & Landon. :) Miss you! I can't wait to meet him! He is so beautiful Rachelle! Was Ko's hair that dark when he was born? I'm glad everything went so smooth! Your family is so darling! Congrat!! He is so sweet. Lucky for you he was early, he could have been a really big boy if not! Big brother just loves his little papoose brother. How cute. Congrats! He is a handsome little guy! You have an adorable family! He is so cute! Congrats! Kohen is going to love having a little buddy:). You fantastic by the way! He is so cute. I love his dark hair! He is so cute, and Kohen looks like he is going to be an awesome big brother! I am so happy for you guys. I came by your house yesterday, but you must not have been home yet. I'll try to stop by soon. He is so cute! Congrats we are so excited to meet him:) I am so glad everything went well and Ko looks so excited to be a big brother!! Oh, he's so cute Rachelle! Congratulations! 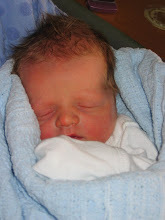 I can't wait to see him in person... judging by the pictures, I think he looks exactly like Kohen. And by the way, you look way too good for just having had a baby! CONGRATS! So I see a little RED in his hair? Can't wait to meet the little guy! Welcome Baby Landon! He is such a cutie. I'm glad everything went well and fast... thats how we like it. I love his mohawk. You look great and looked so cute when I came to see you! Congrats Frame family, what an adorable baby boy he is! I love the name Landon, and look how cute Kohen is with him, I love it all! Hope you're feeling well and be sure to give me some two children pointers! You look great!!! Oh my gosh!! He is sooo cute!! I am so excited for you guys!! 2 is so fun!! He looks like Kohen, I think!! Congrats!! Congrats! He is darling, and I am loving all that hair. Rachelle, you look beautiful, way too beautiful to have just given birth. You must be made to have babies:) Glad everything went well. Love you lots! Congrats! What a cute little man. I'm so glad everything went smooth for you guys! Our BABY BOY is TWO! !